Titeeksha Tawde is an Indian actress who is primarily active in Marathi entertainment domain. She was born and brought up in Mumbai. She was born on 3rd July 1990. She did her schooling from Bombay and junior college and graduation in this city, while her interest in Hotel Management led her to Goa wherein she got her admission in IHM completing her degree in HMCT. During her school days she was active in sports and even represented her state in Cricket while she was in high school. After completing her graduation in Hotel Management she returned to Mumbai, however, she later pursued her career in acting. 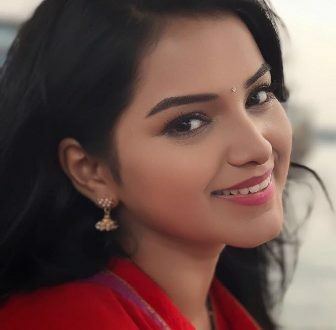 She got the chance to work in Singham as a Junior Artist, while she also got the chance to work in small screen for Marathi TV show called Saraswati in the lead role, which started in the year 2015. Talking about her personal life, she is still unmarried and she is focusing on her work rather getting indulged into any kind of activities. Though she was born and brought in Mumbai, but her family is from Delhi. She is fondly called by her friends and family members as Guddu and she prefers to be called with this name as she finds her name difficult to pronounce by others. Talking about her favorites, she likes actors like Irrfan Khan, Randeep Hooda, Deepika Padukone and she likes Chicken Dishes a lot. Her elder sister, Khusboo Tawade is also an actress in M Town. Her first venture in Marathi TV was Sanskruti, which is still going on the small screen. She is also active on social media and loves to post about various things. Recently, she was in news for posting a long message on the eve of her elder sister Khusboo. The two sisters are close to each other and she defines Khusboo as her big secret keeper. They share a good bond between themselves.